Gorgeous watercolour painting of a Brown Trout by a top British Ceramics artist and designer. A beautiful single pack on top-of-the-range Premium Quality 330gsm card – the best quality decorative twin pack available from us. Limited edition run of 500. Our Premium Quality playing cards have the most fantastic slip, snap and elasticity. 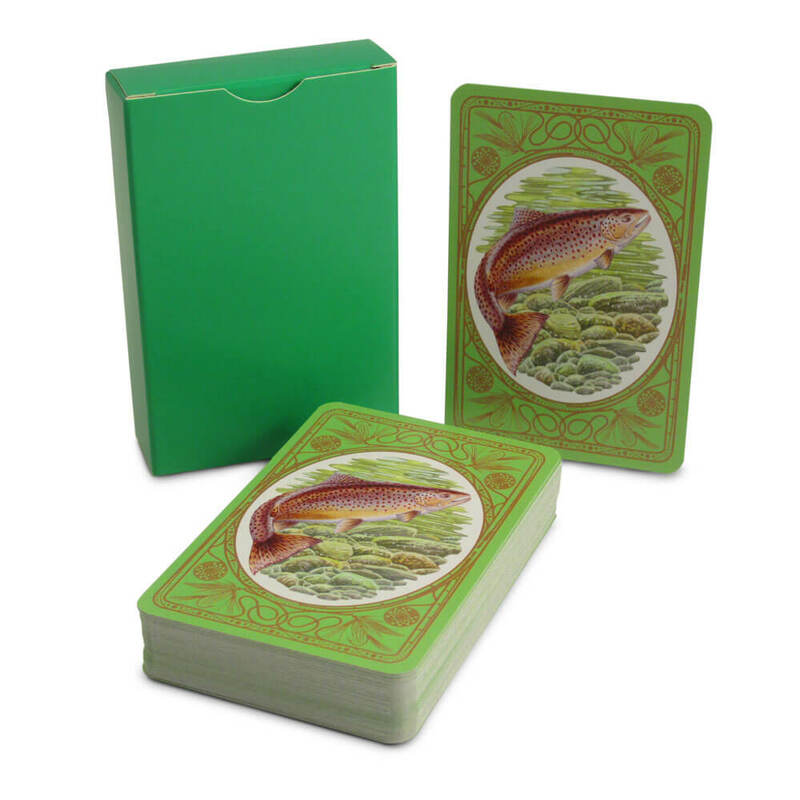 We are pleased to continue our countryside theme of playing cards with this beautiful pack of Brown Trout playing cards. Featuring a gorgeous watercolour painting of a Brown Trout by a top British Ceramics artist and designer, this is one design in a range of Premium Quality decorative playing cards made from the best quality board. Black-lined for opaqueness, the beauty of the dense 330gsm board is that it has optimum flexibility. Finished with a special varnish for the most favourable slip and handling, these beautiful playing cards are durable and a delight to use, providing a top-quality cardplay experience. We really enjoy seeing the delight on customers faces when we hand them a pack to shuffle! Limited edition run of 500. Brown Trout [Salmo trutta ] is an important native species of the British Isles. Whilst brown trout and sea trout are the same species, it is thought that a combination of genetics and environmental factors such as lack of food make some trout go to sea before returning to spawn; this is known as an anadromous lifestyle. The Sea Trout in the British Isles have many regional names. They’re know as Sewin in Wales, Finnock in Scotland, Peal in the West Country, Mort in North West England and White Trout in Ireland. In small streams, brown trout are important predators of macroinvertebrates, and declining brown trout populations in these specific areas would affect the entire aquatic food web.